The center of mass is the point at which the mass of an object is concentrated. For this reason it is used for calculations on the effect of forces and torques on an object. It is the point around which the object will rotate if subjected to torque forces. Center of mass is calculated using a reference point outside of an object and the mass of the object at different distances from that reference point. Choose a reference point outside of the object you want to calculate the center of mass for. This point is arbitrary but should be reasonably close to the object. Multiply the mass of the object (M) by the distance between the object and the reference point (R). 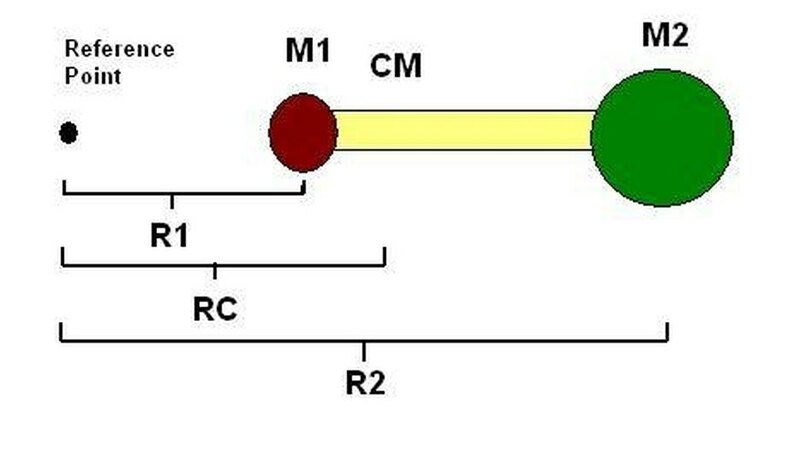 Using the above diagram as an example, the 10 pound weight on one end of the two dimensional object is M1 and the 30 pound weight on the other end is M2. R1 equals five inches and R2 equals 15 inches. For this system, M1 x R1 = 10 x 5 = 50 and M2 x R2 = 30 x 15 = 450. Add the results from the above step. For example, 50 + 450 = 500. Add M1 and M2. For example, 30 + 10 = 40. Divide the sum from Step 3 by the result from Step 4 to get the center of mass for the system in relation to the reference point. For example, 500 / 40 = 12.5 inches. For three dimensional systems, follow the same formula but use a vector for the distances to the reference point. Finn, Kaylee. "How to Calculate Center of Mass." Sciencing, https://sciencing.com/calculate-center-mass-5217613.html. 24 April 2017.